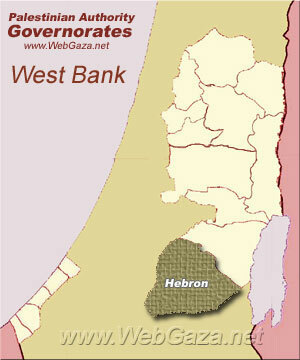 Hebron Governorate - What is Hebron Governorate? The governorate's land area is 1,060 square kilometers and its population according to the Palestinian Central Bureau of Statistics in mid-year 2006 was 542,593. This makes the Hebron Governorate the largest of 16 governorates in both population and land area in the Palestinian territories. The city of Hebron is the district capital or muhfaza (seat) of the governorate. The governor is Hussein al-A'araj and its district commander is Abdel Fattah al-Ju’eidi. The Hebron Governorate has a total of seven cities and eighteen towns. The governorate also contains more than 100 Bedouin villages and settlements that are not listed below. The following localities have municipality status from the Ministry of Local Government of the Palestinian National Authority. The following have populations over 1,000 persons.